MITHI: A large number of workers of the Awami Tehreek (AT) embarked on a 32-day-long march on Sunday against ‘anti-Sindh’ projects, Gorano dam, water crises, lawlessness, unemployment, terrorism and other issues. 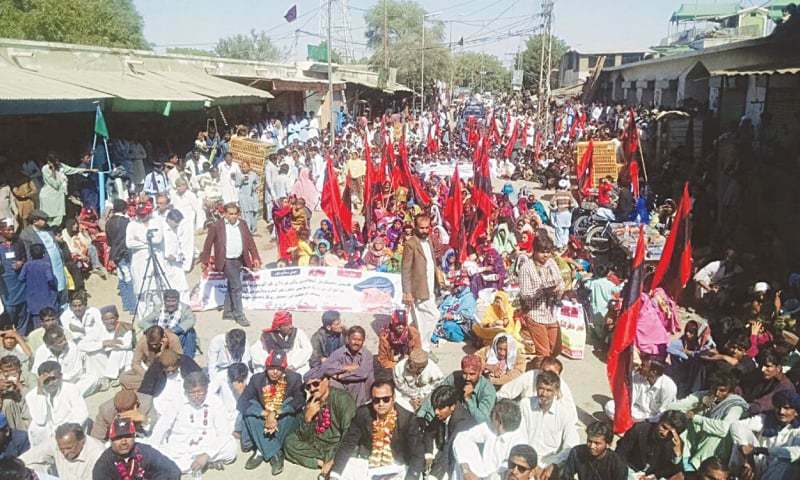 Led by their octogenarian leader Rasool Bux Palijo, they started the march from Islamkot town of Tharparkar district under the slogan of ‘Save Sindh’. Charged AT workers, including women and children, were carrying placards and banners inscribed with slogans in favour of their demands. Before starting the march, AT workers along with the protesting villagers staged a sit-in for five hours outside the Islamkot press club. Talking to local reporters and addressing the party activists, Mr Palijo said they had launched their peaceful march to save Sindh from those who had plundered the resources of the province mercilessly. “We are not against the China- Pakistan Economic Corridor (CPEC), but nobody will be allowed to dislodge local people and cause destruction in the name of development projects,” he said and added that China must act wisely before executing the controversial prtojects under CPEC. “The water reservoir on 1,500 acres of the land will only cause widespread devastation in the arable lands of Gorano and over 12 other villages of the region when the water from the coal mines from Block II of the Thar coalfield will be pumped into it,” added Mr Palijo. He said their march from Islamkot to Karachi would create ripples in the political circles of the country, but would also help people get their rights. The senior leader lashed out at the Sindh government for the rampant corruption, lawlessness, water crises and other issues facing Sindh. Others who also spoke on the occasion included party’ president Ghulam Nabi Khoso, Wasand Thari, Sajjad Ahmed Chandio, Ms Zahida Shaikh, Shamshad Leghari, Mir Hassan Arisar and Qadir Ranto. Shopkeepers and traders kept their professional activities suspended for a half day in Islamkot to exprress solidarity with villagers and workers of the AT.